In Mihály Munkácsy’s painting “The Blind Milton Dictating Paradise Lost to His Daughters” (1877), a man dressed all in black except his for white Puritan collar sits in a chair, staring down as if looking inward. His three daughters stand nearby, one with paper and pen. This scene has some truth to it: Milton had been blind for about six years when he started writing his epic poem, and he needed the help of aides (though probably not his daughters) to get it on paper. The story behind the story is compelling; it shows a man so determined to “justify the ways of God to men” that he would compose the metered but unrhymed verse in his head and then dictate it. In fact, at the 350th anniversary of its publication, Milton’s masterpiece seems ever more relevant. If not for its complicated syntax and unmarked dialogue, Paradise Lost (published in 1667) would fit right into contemporary culture. I can picture it as a Hollywood blockbuster or the next “Peak TV” event, but its most important resonances—for me, as for any reader—will always be personal. Here walked the fiend at large in spacious field. Sure, some of the language is a bit thorny (Milton is famous for inverted word order), but I love how after a description of our world, we get the short, punchy phrase, “Satan alighted walks.” Then, as if the camera were zooming in, we see the round Earth, a large continent, the storms of Chaos, a small glimmer of light from heaven, and a spacious field where a solitary figure walks. Milton was so determined to “justify the ways of God to men” that he would compose the metered but unrhymed verse in his head and then dictate it. Whether the poem is adapted for large or small screen, Satan himself is the original antihero, forerunner to characters like Tony Soprano, Walter White, Dexter or Don Draper. 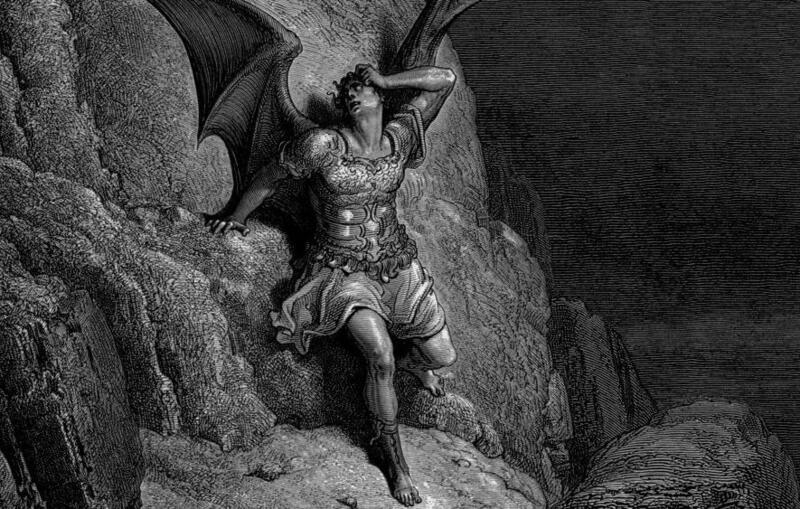 The Romantic poet William Blake even said that Milton was “of the Devil’s party without knowing it.” For the first few books, the charismatic demon’s concerns are front and center, and God seems authoritarian and legalistic. Which now sat high in his meridian tower. He is not the absolute evil we may have expected, and a sympathetic devil is a dangerous devil. He admits in Book IX that he does not hope “to be myself less miserable/ By what I seek, but others to make such/ As I...:/ For only in destroying I find ease/ To my relentless thoughts.” We have all watched an episode in which one of those iconic antiheroes lashes out at others to ease his own discomfort. In Milton's poem, Satan himself is the original antihero, forerunner to characters like Tony Soprano, Walter White, Dexter or Don Draper. Their devotion to each other gives them a complexity that we do not get in Genesis. Adam eats the forbidden fruit not because he is fooled but because he does not want to be without Eve. At the end of the poem, she says she will go with him wherever he goes: “thou to me/ Art all things under heaven, all places thou.” They have lived through the loss of their most beloved place (another theme probably meaningful to many) and the good regard of their creator, but they are ready to confront the unknown future together. Paradise Lost is a poem that requires careful attention, a challenge in this digital age, but it is well worth it to read a sentence at a time, a book at a time. I cannot say what will appeal to other contemporary readers—meditations on free will, the psychological nature of hell, the poignant goodbye to Eden—but I know those who take the time to do a spiritual reading of the classic poem will reap its rewards. Milton is a very great poet. He is also a great antinomian heretic. Not only is his theology of marriage heretical, but even his Christology is. Anyone who doubts that should read his "Christian Doctrine." In it, he seems closer to a Mormon than to an orthodox Christian. This is important because, in the English-speaking world of the our American and Puritan past, his version of Genesis and the Fall have had as much or more influence than orthodox Biblical exegesis. Lisa Ampleman, managing editor of The Cincinnati Review, is the author of a collection of poems, Full Cry, and a chapbook, I’ve Been Collecting This to Tell You. Her poems and prose have appeared in the journals Poetry, Image and Notre Dame Review.